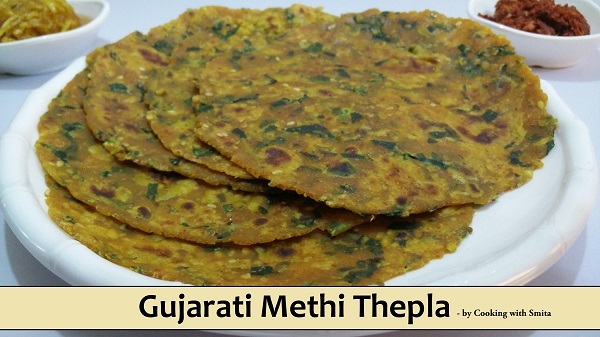 Methi Thepla, a must try lightly spiced paratha like traditional Gujarati flatbread Recipe prepared from wheat flour, Fenugreek leaves and other spices. Theplas are an inherent part of Gujarati meals and are cooked for regular meals and travelling. It tastes best when eaten with Garlic Chutney, Curd and Chunda. Take a large bowl and add Wheat Flour in it. Add chopped Methi Leaves (Fenugreek Leaves), Green Chilli & Garlic Paste, Sesame Seeds. Add all Masalas – Red chilli powder, Kashmiri chilli powder, Ajwain (Carom Seeds), Garam Masala, Turmeric Powder. Add Curd, Salt and 2 tbsp Oil. Now add ½ tsp Oil and knead again, cover with a lid and keep it aside for 15 minutes. 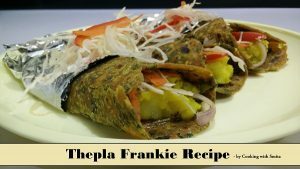 Sprinkle some flour on a ball and with the rolling pin begin to roll the Thepla. On hot Tawa place the Thepla. Flip when partially cooked from one side. Spread oil on one side and flip again. Now spread some oil on other side and flip the Thepla again. Flip couple of times & cook till you get golden brown spots on both sides. You can also press the Thepla with a spatula while cooking. Keep it in Roti basket or serve hot with Garlic Chutney, Chhunda (Mango Pickle) or Curd.